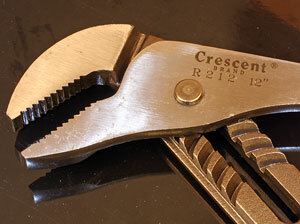 I guess it shouldn't surprise any of us that Crescent® makes some nice pliers that all of us can use. The low prices did surprise me though. Nearly 60 years ago when I first started becoming aware of tools I found the venerable Crescent® Adjustable Wrench on my Dads workbench and I’ve never had enough tools since. At age five or six I knew just enough about an adjustable wrench to set it just tight enough on a stuck nut so that it wouldn’t slip until I was really leaning on it. Of course I leaned a little harder, it slipped and I bloodied my knuckles for the first time in my life. Since then I have learned how to properly set an adjustable wrench and Crescent® has gone on to apply their tool building acumen to an ever-expanding line. 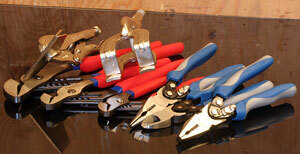 In this review we look at some of their line of pliers and adjustable clamps. This type of pliers has been around for decades and while the general overall shape remains fairly consistent virtually nothing else about them does. As you might suspect the folks at Crescent® had some ideas to improve their version. Everything from the teeth to the grooves and the hardened pivot pin make the Crescent® Tongue and Groove Pliers different. The handle treatments (right) on the Crescent® makes them comfortable and more controllable. Using a purpose designed steel alloy was a no brainer for Crescent® since they have been designing metals for their tools for more years than most of us have been alive. They also know how to treat that metal during manufacturing to insure function and durability. In the case of the Crescent® Tongue and Groove Pliers that include induction hardening of the teeth so they grip tightly for many years. The design of those teeth was also given the Crescent® treatment. Where common pliers use triangular teeth Crescent® uses a sort of opposing saw tooth arrangement that encourages them to get a solid bite when pressure is applied downward through the handles. While we are at the handles, notice the cushioned -covering that helps prevent slippage while ensuring more comfort. 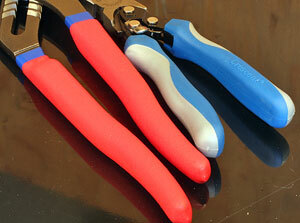 The tongue and groove surfaces of these pliers are what give them their range of sizes and power. Crescent® added more sizing options with the 7” and 10” versions having 6 positions and the 12” model having 8 available. The 7” model has a maximum jaw opening of 1-5/16” the 10”model opens to 1-13/16” and the 12” version can open to 3” The machining of the tongue and groove surfaces is precise so the interaction is smooth and slip free. Crescent® also revised the pivot rivet so that the tongue and grooves stay engaged and can’t slip by one another even under heavy pressure. All of the Pro Series pliers share the compound leverage handles and handle designs. 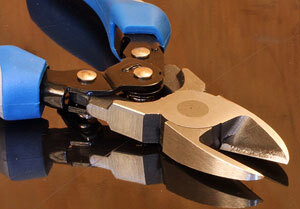 This group of pliers share several characteristics that make them tough yet easy to use. First is the use of chrome vanadium steel that is known for its durability. During manufacturing that steel is heat treated to further strengthen its capabilities. Cutting edges are induction hardened to help keep them sharp for a long time. They also specially heat treat the joint rivet so that it remains snug while others loosen and compromise the performance of the plier. All of the Pro Series pliers use a compound leverage system that increases the pressure generated by approximately 60-percent. 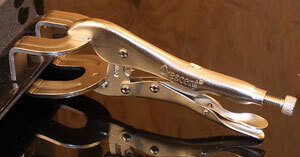 A finger-operated locking lever keeps the jaws of Crescent® Pro Series Pliers closed during transport and storage. The handles of all Pro Series pliers are self-opening thanks to a spring that makes continual use easier and faster. The Pro Series pliers all feature “Co-molded” grips that offer superior cushioning along with a grip-enhancing surface that provides even more control. The 9” Pro Series Long Nosed Pliers (top right) has a uniquely shaped set of jaws that provide both flat and rounded gripping surfaces that make them effective in more situations. The cutting area near the base of the jaws is generous in size to let you cut larger wire with more insulation. The 9” Heavy Duty Diagonal Cutters (middle right) have a tapered head that makes trimming wire or staples close to a surface easier. The angled head can also be used as a fulcrum for puling small nails. Between the compound leverage handle system and the specially hardened cutting edges these cutters operate with surprising ease. Crescent®’s 9” Heavy Duty Lineman’s Pliers (bottom right) have a uniquely shaped head with multiple angles ground into the outer surfaces that can function as fulcrums for removing tacks and small nails or pulling wire. The hardened teeth are formed into flat and curved sections of the jaws that make gripping screws, nails or wires easier and more secure. Of course the cutting edge is very effective with that performance enhanced by the compound leverage of the handle system. 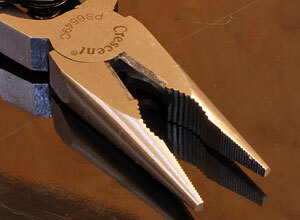 This Sheet Metal Pliers (top left) is very useful for much more than pure sheet metal working. Welders use them to hold pieces together temporarily for tacking and they can be used to bend or hold sheet metal edges for other fastening operations. The flat 3-1/8”-wide jaws give you a broad surface to work with and the adjustable clamping pressure means you can secure the work without damaging it. 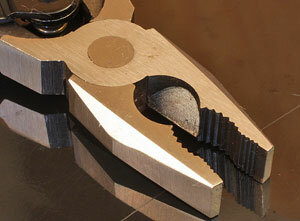 The straight edge of the jaws makes folding seams faster and more accurate. The all-metal construction of the Locking Sheet Metal Clamp insures durability in even hostile work sites. The locking capabilities of these clamps is much like having an extra set of hands in the shop! Long a mainstay of welding shops this type of plier/clamp is like having an extra set of hands in the shop for many welding and assembly tasks. The 2-3/4”-wide U-shaped jaws give you two distinct clamping locations that makes tack welding or other fastening operations easy and very accurate. The adjustable clamping pressure means that you can handle a wider range of jobs without causing damage that has to be repaired later. It is encouraging to see an established tool company like Crescent® expand their line with quality tools that have utility in shops from the full on professionals to the home-based DIY crowd. Pliers have a fairly simple job description but attention to detail during design and manufacturing put the offerings shown here from Crescent® head and shoulders above much of the competition that often carry a very similar price tag. 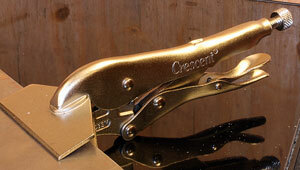 When you need to add pliers to your tool collection, be sure to check out the pieces from Crescent®. These are well-made, thoughtfully designed tools that carry real-world price tags that make them exceptional values for our tool dollars.